I’m a long-time fan of Carlos Castaneda‘s books, and Wooten’s The Music Lesson is cut from similar cloth. In the Castaneda books, the author–an anthropologist–studies with a Mexican Yaqui shaman by the name of Don Juan Matus who teaches the author many things: about plants, about spirituality, about his own inner self, and much more. This is done in a humorous and almost entirely believable way. Debate still continues as to whether the books are fact or fiction. Castaneda used them to earn degrees in anthropology from UCLA. Later critiques question how factual the accounts were. While the “authenticity” of Castaneda’s books are still in question (the scare-quotes are because what is authentic does not always have to be factual), The Music Lesson is clearly a vehicle for Wooten’s philosophy of what music is and what it takes to have a meaningful, sustaining relationship with it. And don’t get me wrong. Wooten isn’t trying to pass this book off as fact, evidenced by his words on page vii: WARNING: Everything in this book may be all wrong. But if so, it’s all right! 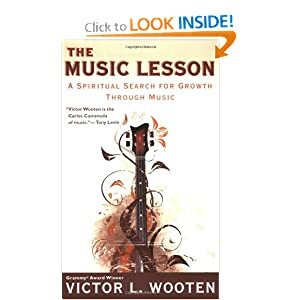 The Music Lesson is also a first person narration about a master teacher who appeared Wooten’s house one day, oddly dressed, acting even more oddly, challenging the narrator to question his assumptions. Throughout the book this teacher–Michael–and a couple other improbable teachers, push the narrator toward a deeper understanding of Music and Art by way of many situations and adventures. The book is cleverly constructed around 12 “bars” (chapters), with a prelude up front and a coda at the end. The chapters are named after musical elements touched on in the chapters: groove, articulation, emotion/feel, rhythm/tempo, tone, listening, etc. It’s an easy read, and I enjoyed the book. I did find some of the dialogue stiff and not particularly believable. Turn on your suspension of disbelief, for sure. Had this been fiction or an attempt at magical realism, I would’ve stopped reading, but it was Wooten’s intent that kept me turning pages, and I applaud him for that. Especially satisfying for me was the end of the book and the way he brought things full circle. While The Music Lesson won’t give you many specifics about what to actually do when you practice, the book does contain a lot of food for thought and a way of relating to music that resonates with my own experience and philosophy. If you haven’t read it, go check it out of the library or buy a copy. Let me know what you think.